Meet the Residents is the debut studio album by the American avant-garde music group the Residents, released on April 1, 1974 through Ralph Records. Recorded as a break from their film project Vileness Fats, the album was home produced and recorded throughout 1973 with help from fellow musician Snakefinger and based around N. Senada's "Theory of Phonetic Organization". Its album cover brought the band to prominence, being a parody of Meet the Beatles!, the Beatles' second US album release. EMI and Capitol were angry with the cover and threatened to sue (though it is rumored that George Harrison or Ringo Starr loved the cover and bought a copy). Due to the labels' complaints a 1977 reissue had a different cover, still parodying the Beatles but this time featuring "John Crawfish, George Crawfish, Paul McCrawfish, and Ringo Starfish", with illustrations of the applicable sea creatures wearing Beatles suits. The original pressing of the album sold poorly, reportedly selling only forty copies in its first year, with most being returned to the publisher unopened. There exists two versions of the album; the first is of the original 1974 vinyl pressing, which is unedited and in mono, and the second of the 1977 pressing which is in stereo but runs shorter by roughly seven minutes. Subsequent re-releases of the album have alternated between these two versions. The first CD pressing was the first edition to restore the full unedited mono, but subsequent CD editions have reverted to the edited master. CD releases of the album in 1988 included tracks from the 1972 double single "Santa Dog". The 2018 pREServed double CD edition features both the 1974 mono and 1977 stereo versions, plus the Santa Dog double single and various outtakes. Although Meet The Residents was largely ignored at the time of its release, it has since garnered critical acclaim. David Cleary of AllMusic gave the album 4 stars, calling the band "true avant-garde crazies...[their] work of this time really sounds like nothing else that exists." Nils Bernstein of eMusic also gave the album 4 stars, saying its "brilliance lies in collaging less avant-garde elements like vaudeville, early rock ‘n’ roll, world music and snippets of pop culture in "songs" that were as disorienting as the barrage of media and consumerism they subtly critiqued – the medium is the message, indeed." In a positive review, Julian Cope said of the album "just as DJ's would play the best minute and a half or so the latest garage, soul or pop hits before fading it out into another great single before the listener gets bored, the Residents weld together a collage of the most annoyingly catchy riffs and tunes leaving the listener initially confused and later hooked." All songs written and composed by the Residents, except where noted. ^ a b Bernstein, Nils (April 5, 2011). 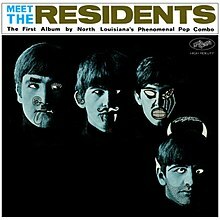 "Features + Reviews - The Residents, Meet The Residents". eMusic. Retrieved 2012-12-14. ^ "Meet The Residents - CD Liner Notes". residents.com. Archived from the original on 2012-12-10. Retrieved 2012-12-14. ^ Buckley, Peter (2003). The Rough Guide to Rock: The Definitive Guide to More than 1200 Artists and Bands. Rough Guides. p. 868. Retrieved 2012-12-14. ^ Cope, Julian (2000). 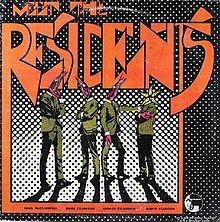 "Unsung Reviews: THE RESIDENTS - MEET THE RESIDENTS". Retrieved 2012-12-14. Whatever Happened to Vileness Fats? The 13th Anniversary Show Live in the U.S.A. This page was last edited on 18 November 2018, at 17:34 (UTC).